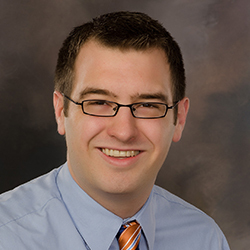 Matthew Fleming of Denver, Colo., joined the staff of Cuyuna Regional Medical as an Orthopaedic Physician Assistant in July 2015. A graduate of the University of Charleston in West Virginia, Fleming holds a Master’s degree in Physician Assistant Studies. He earned his Bachelor of Science degree in Biology with a minor in philosophy at Franciscan University of Steubenville in Ohio. Fleming has extensive clinical experience in orthopeadics as well as pediatrics, internal medicine, obstetrics/gynecology, psychiatric medicine, primary care, emergency medicine, general surgery, family medicine and as hospitalist. His work experience includes being a CRMC nursing assistant/registered, Hallett Cottages housing aide, and Francisican University of Steubenville Athletics Department student medical assistant. He has also held several volunteer positions and served on mission trips. The physician assistant’s wife, Becca, is a Crosby native. The couple has a two-year-old son and are expecting a second son in October. Outside of work, Fleming enjoys spending time on the bike trails and out on the lakes with his family.